Chesterfield rally-driver Rhys Yates with his new Skodia Fabia R5. (PHOTO BY: Stanislav Kucera Photography). 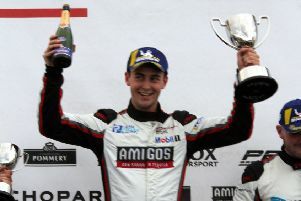 One of the biggest seasons of his rallying career is about to get under way for ambitious Chesterfield driver Rhys Yates. Yates heads to the remote Portuguese islands of the Azores this week to make his debut in the FIA European Rally Championship. And the Azores Rally also marks the first appearance of his new Skodia Fabia R5 car, which has replaced the Ford Fiesta R5 that he successfully campaigned in his 2016 and 2017 Brfitish Championship assaults. The 25-year-old Yates, who has enjoyed fine results at all levels of the sport, is hoping the move to the Czech machine will further enhance his prospects. Backed by Brettex, he has used the close season to acclimatise to the Fabia and has travelled to Sweden with his team to sample driving on the snow. He starts this week’s rally as number 18 seed. Yates said: “We have had a mega response to the new car, and I feel more prepared for this season than ever before. The European Rally Championship is one of the most competitive in the world, and the Azores Rally comprises 200km spread across three tough days.